I’m stealing a few minutes here to say hello because tonight the Hydens are hosting a huge New Year celebration and I’m in charge of the food (natch). With more than three hundred people scheduled to arrive after nine o’clock this evening, I’m relieved we aren’t plating a four-course dinner. Instead, Mrs. Hyden requested we prepare an assortment (a huge assortment!) of appetizers and finger-friendly desserts. We’ll be prepping items and sending them upstairs with tuxedoed butlers until the party winds down. No idea how long the partyers will stay. The Hydens haven’t been at the White House all that long yet, and this is the first time they’re hosting New Year’s Eve. People ask me if I mind not being able to ring in the new year at home, or at a party of my own. I don’t mind at all. Really. For years, I spent the night all by my lonesome, watching the revelry in Times Square on TV while treating myself to popcorn or Baskin-Robbins chocolate-chip-mint ice cream (a guilty pleasure). You know what? I enjoyed the solitude. I loved being able to reflect on the year that had just passed and to dream and plan for all that was fresh and new ahead of me. I took that quiet time for myself every year, thankful to be alive (after some harrowing experiences), and determined to stay out of trouble going forward. A few changes this year, however, are requiring adjustment on my part. First off, I’m here at the White House working through the festivities. Second, I have a brand new relationship to consider. This will be our first New Year’s Eve as a couple and I confess that I’m secretly glad to be working—it takes the pressure off. Looking ahead to next year, my team and I may be preparing for another big presidential party, I may make plans to be with that certain someone, or I may be alone with my ice cream and TV. Who knows? By the way, it’s been a busy year. Very busy, in fact. Shortly after Buffalo West Wing wrapped up, I got involved in a messy murder. Worse, I was teamed with Peter Everett Sargeant when I found the first body… and the second. If you know how well Sargeant and I get along, you’re feeling my pain, aren’t you? I hope you’ll pick up AFFAIRS OF STEAK and find out what happens to us. There’s a lot going on behind the scenes in this one. And in my love life, too. I don’t want to tell you more than that right now because all the fun in life is in discovery, isn’t it? Hmm… that may be the very sentiment that gets me into trouble all the time. You think? Can’t worry about that now. I’ve got two hundred cherry tomatoes to stuff. Be well, enjoy the night, and all my best to you in 2012. By the way, what are your plans this evening? "All the fun in life is in discovery." Thanks for that, Ollie. Curiosity has gotten me into trouble also, but how can we not be curious? Willow, you and I need to have coffee one of these days. Come on out to the White House and we'll compare notes! 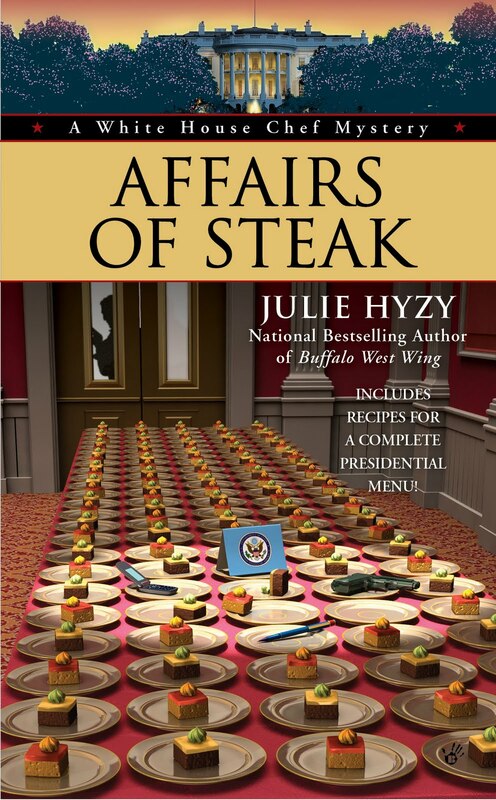 I have Affairs of Steak pre-ordered and ready to download onto my Kindle on Tuesday. I am really looking forward your newest adventure, Ollie! I'm all for solitude and reflection, as long as loneliness doesn't tag along. Spending New Years Eve with family and friends works best for me. Whichever way, hope it's the start of a wonderful year! Harbingerdc - I can't wait to hear your thoughts about this one! Victoria - yep. And don't even get me started on how many mini Beef Wellingtons we had to create! Olivia, all the fun is in the discovery! I agree. Ollie, I am looking forward to Peter Everett Sargent being one of the bodies you find soon. Any chance of that? I know he's a great antagonist, but I keep picturing his murder....so many options! It's almost lunch time on the west coast and this post made me salivate for AFFAIRS OF STEAK as well as the real thing. Does anyone have a recipe for mini beef wellingtons? Yum. Charlotte! How's the Cheese Shop? Debra - Sargeant's as annoying as a person can possibly be, but as of this moment, at least, he's still alive... and driving me nuts. Cindy - I had one at a party recently, so delicious! I've been experimenting lately, but the recipe for a full Beef Wellington is in Affairs of Steak. Thanks for asking! Oh Ollie, happy new year to you! Can't wait for the new book! And what a good attitude you have about New Year's--so much pressure on these big holidays--especially with a new guy in the picture. Or if you've been recently dumped:(.